Tired of throwing the same old birthday party? Looking for a North Carolina birthday party idea that makes you a hero, while making their special day easier on you? Rockin’ Rollin’ Video Game Party™ and Laser Tag provides the ultimate no stress – no mess birthday party experience! Your birthday boy or girl will be thrilled beyond compare when our 32’ limousine styled video game theater rolls up to your residence! 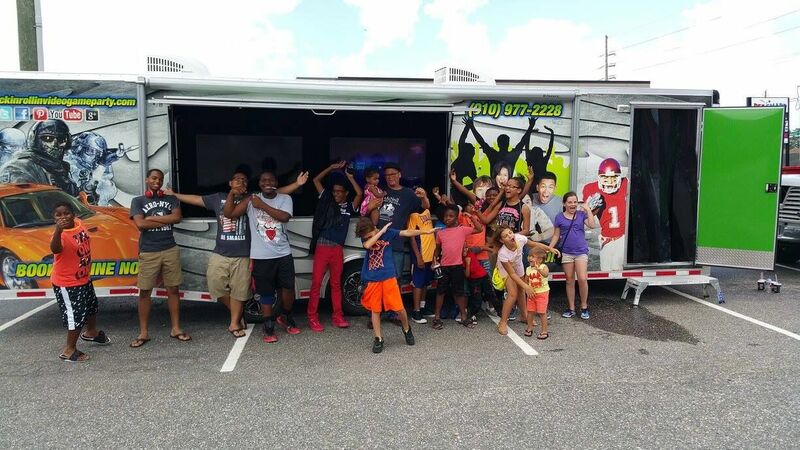 Inside our Mobile Video Game Theater, we provide comfortable stadium seating for up to 28 with high tech video and audio, and 29 kids can simultaneously play games at our eight game stations. Our mobile game theater is climate controlled, so we’re ready to party year round! Our Virtual Reality Gaming Station lets you get in the game, with VR headset and controls that will immerse you in the action! We’re available in and around the North Carolina area and were the idea that will bring fun to your next birthday party. It’s So Easy to have North Carolina’s best birthday party! – After your party is confirmed and paid for, we’ll send you up to 30, high quality invitations, to mail to your guests.